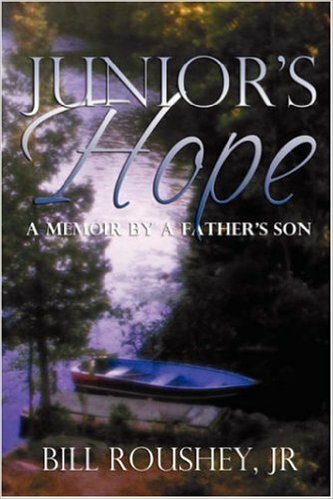 I am getting ready to rerelease my book, Junior’s Hope, in the next couple of weeks. This was my first attempt at writing a book, originally published in 2006 (see picture on left of original cover). The book is a father/son love story that focuses on faith, family and and overcoming adversity. I updated the book with some minor edits and added another chapter, kind of a ten year anniversary thing. My story “fish” that I have been blogging about recently runs parallel to the book’s story line (offers additional insight into material covered in the book). There is one chapter in Junior’s Hope called “A Season of Winter” that I intended to be a poetic reprise in the middle of the story, much like a bridge does in a song. I edited the chapter for this post so as not to spoil the story. I hope you enjoy my attempt at writing prose. … I have visited this place often. On most occasions I come here with no particular need or agenda—just to reflect or rest my weary mind. There is an unexplainable peace found here. Sometimes, without expecting it, I carry away a gem of wisdom that helps sustain me on my journey. In this place a maple tree stands alone towering over the landscape. Only God knows how long it has been here. Its grayish brown trunk rises from the earth, carrying its physical presence high into the air. There are scars and imperfections evident on the surface of the tree’s bark where wounds, endured over time, have healed as it aged. An untold number of subdividing branches emanate from the trunk, rising ever higher, stretching outward as they ascend. The tips of the branches sway in rhythm prodded by a gentle breeze—like boney fingers scraping the sky. On this day there is not a single leaf present to offer me shade from the sun. What a brilliant sunny day it is too! The fiery yellow ball hangs in the heavens with grandeur. The sun’s brightness is so intense that I have to squint to survey my surroundings. The few wisps of clouds present are unable to conceal its beauty nor soften the rich blue color of the sky cradling it. Yet, the sun offers me no warmth. …As I tarry, chills race up my back, morphing into shivers that rumble through my torso and spread outward to my arms and legs. My fingers and toes tingle in the cold. Shoring up the collar of my coat around my exposed neck, I draw in a long deliberate breath, inviting the cold air into my body and allowing it to sting my lungs. The frigid air feels so fresh and pure as it is drawn in—so brutally honest. When I exhale, a cloudy mist trails from my lips, dissipating as it rises skyward. …In nature the familiar truths we rely on and take for granted are undone by winter. Trees like this one cannot offer shade without its leaves. The sun struggles to heat the cold air. Frozen streams separate us from the thirst-quenching water we long for. Breezes, refreshing on warm days, are measured by their wind-chill factor in winter. Even the roads, lawns and gardens we toil to create are ransacked by storms wrought from winter’s fury. This entry was posted in Poetry, What to read, Writing and tagged Christian, faithfulness, God, hope, seasons, Winter, writing on September 7, 2015 by roushwm.